Space Tomatoes: And here you just thought volcanos could do it. Probably those damn polar bears farting and crapping on the ice. Down with Polar Bears. Palin is going to save the world by shooting all of them. First time an island has formed? Plus, this happens all the time on the St Lawerance River, where the water rises or falls and connects or disconnects two pieces of land. 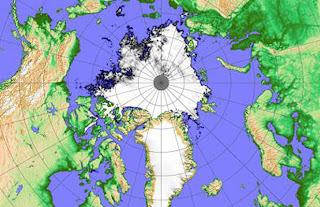 It's the first time this has ever happened to the frozen arctic ice. Not the first time some ice has melted and made islands. So why isn't this all over the news? Hasn't Al Gore flown a camera crew up there to document it? I can't imagine the media not having a hay day over this and calling for the heads of all of us SUV drivers. Bleh, I just remembered I left my Expedition running when we got home from the cookout a few hours ago. Whoopsies. I think the 24 hour news channels are busy covering Gustav and the election. I think Santa needs to ease up on the carbon emissions. We need to regulate reindeer farts. Ahh. It was your sentance structure that was throwing me off. "For the first time in human history, the North Pole can now be circumnavigated."